It did not come down to the last shot like Game 1, but Game 2 was still a nail-biter at the end. Kyrie Irving scored 37 points, Kevin Love added 27 and LeBron James just missed a triple-double as the defending champion Cleveland doused another late rally from Indiana and won 117-111 to establish a 2-0 lead in their first round series. The Cavs entered the payoff period ahead 96-78 but a furious fourth quarter storm by the Pacers cut the deficit down to single digit and even got as close as 109-113 after Paul George’s 27-foot three-pointer with 19.5 seconds left. Game 3 will be at Bakers Life Fieldhouse in Indiana. Irving made 14 of his 24 attempts, including a sneaky layup late in the game that put Cleveland ahead 113-106. Love scored 12 of his tally from a perfect trip to the charity stripe, while James ended with 25 points, 10 boards and seven assists, though he committed eight turnovers. 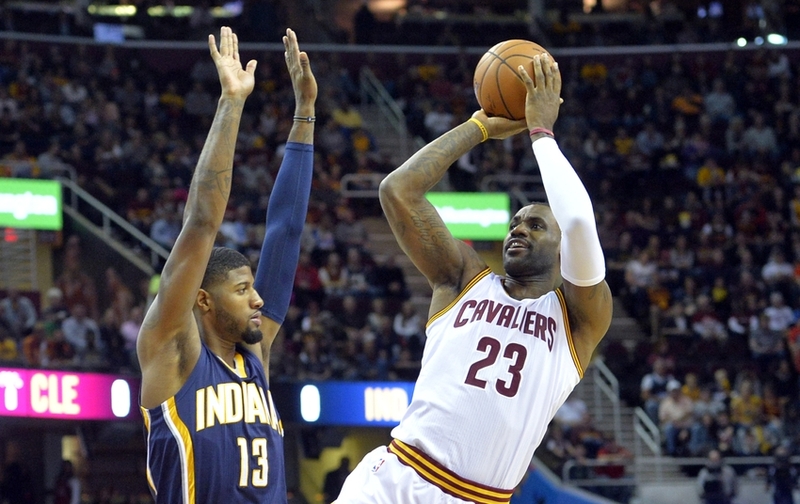 George led the Pacers with 32 points on 10-of-20 shooting, including 4-of-10 from the arc. He also had eight rebounds and seven assists for Indiana, who had 23 points on 8-of-12 shooting from Jeff Teague. Game 1 was much closer, with the Cavs dodging a C.J. Miles-sized bullet at the whistle, as the Pacers guard missed a game-winning jumper that led to Cleveland winning 109-108. Defending Western Conference champion Golden State overcame a combined 75 points from Portland’s spitfire frontcourt duo of C.J. McCollum and Damian Lillard as the Warriors opened their first round series with a 121-109 win over the Blazers. Kevin Durant led the Dubs with 32 points and 10 rebounds, while Steph Curry added 29 points and Draymond Green had 19 points, 12 rebounds, nine assists and five blocks that essentially killed any hopes of a Portland comeback in the match. In the battle of MVP candidates, James Harden scored 33 points with seven rebounds and nine assists as his Houston Rockets mopped the floor with Russell Westbrook and the rest of the visiting Oklahoma City. Westbrook, who averaged a triple-double in the regular season, was subdued and put up 22 points on a horrific 6-of-23 shooting along with 11 boards and seven assists, to go with his humiliating nine turnovers. Back to the east, Chicago became the first eighth seed to beat a top-seed in the opening game of the first round series since 2014, with the Bulls outlasting Boston 106-102 at TD Garden. Jimmy Butler led five Bulls in twin-digit scoring, with 30 points and nine rebounds, while Bobby Portis scored 19 points and nine boards off-the-bench. Isaiah Thomas, playing hours after learning the death of his sister, led Celtics with 33 points on 10-of-18 shooting but also committed six turnovers. In Washington, John Wall excelled in the opener of the Wizards’ first round series against Atlanta. The four-time All-Star finished with 32 points and 14 assists to lead the Wiz past the Hawks 114-107. Wall’s running-mate, Bradley Beal, added 22 points, while Markieff Morris scored 21. All five Washington starters scored in double digits, with Marcin Gortat adding 14 and Otto Porter scattering 10.